This is a "universal" supercharger kit designed for vehicles equipped with carburetted big block Chevrolet engines. We have verified this kit to fit on 1964-1972 Chevelle / Malibu models equipped with a cowl induction hood. Minor bottom-side hood support modifications may be required dependingupon the type of intake manifold installed on the engine. 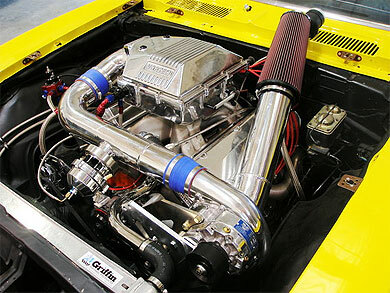 This system was designed to fit on engines equipped with a "long" water pump. Vortech includes a 3-groove accessory drive crank pulley (for use with "long" style water pumps only). If this kit is to be installed on an engine equipped with a "short" water pump, a custom accessory drive crank pulley and spacer will be required. For engines equipped with power steering, a remote reservoir (GM "type 2") style pump will be required as well as an optional Vortech power steering pump bracket and pulley assembly. Depending on the vehicle, power steering lines may require fabrication. The following table can be used to determine crank pulley diameter, supercharger pulley diameter and belt length based off an approximate boost level. *Estimated boost levels based on 454 cubic inch engine at 5200 rpm max.